And because mother knows best, that’s what I did. I already had bookmarked a small pile of chutney and relish recipes in the past, so I eagerly went through them to find the perfect one for our apples. 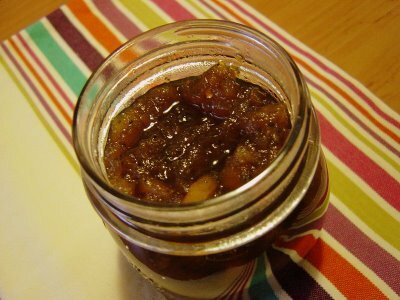 I decided on Spiced Apple Chutney from Nigella Lawson’s How to be a Domestic Goddess because: Nigella can be very convincing when she lays on the “intense, hot flavors” spiel, it was one of the recipes that used only apples, and it really did sound delicious. I had to make a few adjustments to accommodate what I had in my pantry. I increased the recipe so I could use up all the remaining apples. Also, Nigella uses cider vinegar but I had none, so I used a small bottle of pure honey vinegar (it sounded like it would go wonderfully with this chutney), added all the red wine vinegar I had left, and when that was done topped it up with white cane vinegar to reach the required amount. The original recipe also called for turmeric, but I didn’t have that either, so I left that out and hoped for the best. I didn’t have bird’s-eye red chilies, so I used some dried red chilies I got on my trip to Egypt. – Peel the apples and roughly chop. Nigella’s indicated weight was before chopping, but my indicated weight (of the apples, above) was after. – Finely chop the onion and the ginger. Grind spices (I ground them together). – Toss all your ingredients in a heavy bottomed pot or pan and bring to a boil. – Cook until mixture thickens (mine took 1 ½ hours). Keep watch and stir occasionally (later in the cooking I smashed some of the apple chunks and left some whole). 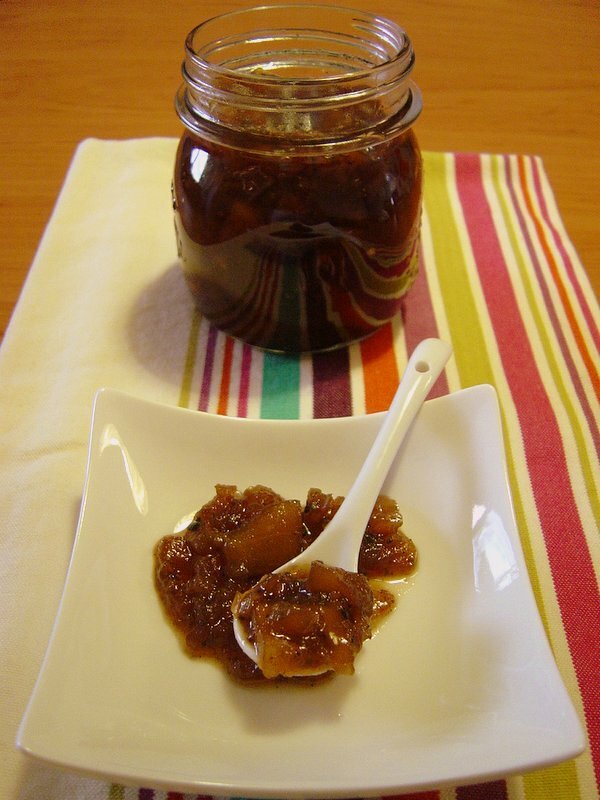 – Spoon the hot chutney into cleaned jars, leaving a little space on top, and close the lid. Turn jar upside down and let cool. Once completely cool turn jar right side up again.A note on cleaning jars: I clean my jars and lids in very hot (the hottest my heater can crank it up to…which is pretty piping) soapy water. I let them dry upside down on a clean tea towel. This being said, I don’t make large batches (that goes for jam too) to store for the winter (as we have none), and anything I make is usually opened right away, stored thereafter in the ref, and finished quite quickly. So, as far as real sterilization goes, it’s best to follow the professionals. The chutney came out a beautiful burgundy, instead of the light golden color of Nigella’s, and it was delicious! Surprisingly delicious for something made to use up a pile of old apples, and considering I had to substitute (and leave out) certain things from the original recipe. 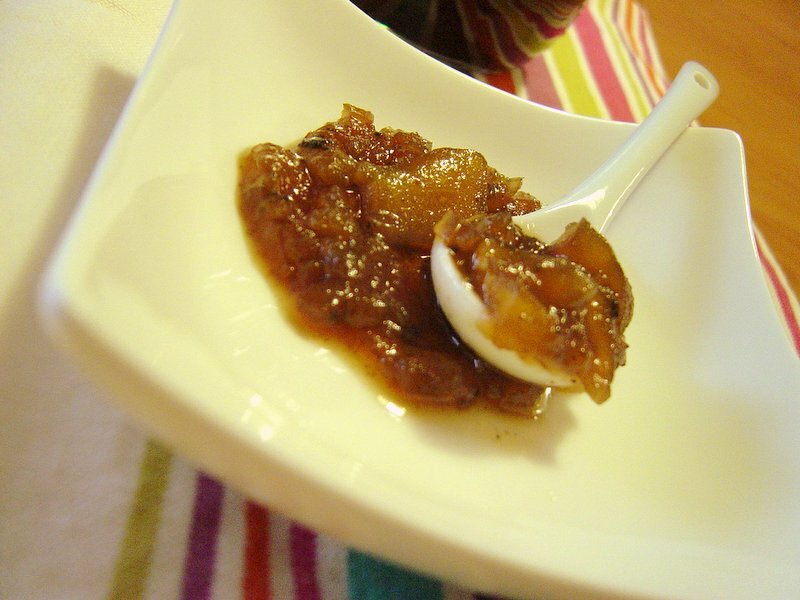 The flavor of the vinegar is a big part of a chutney’s taste and Nigella and I used completely different types. Despite that, this chutney stayed true to Nigella’s promise of “intense, hot flavors”. This will be excellent with your favorite curries, as well as all kinds of roast meats. I love it spooned on a slice of brie, or spread on grilled gruyere on toast. It is also great in cold ham sandwiches with some mustard and greens. For a quick (and economical) appetizer pile it on a brick of cream cheese and serve with crackers. 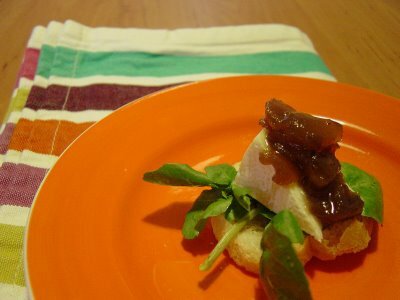 If you have a little more time, make bruschetta and top with some watercress, a small wedge of brie, and a generous smidgen of the chutney. A jar of this would make a lovely gift. And (as these suggestions wouldn’t be complete without her input), Nigella “cannot eat a Cornish Pasty without it“.